Handmade vintage dual phase-shift footpedal. 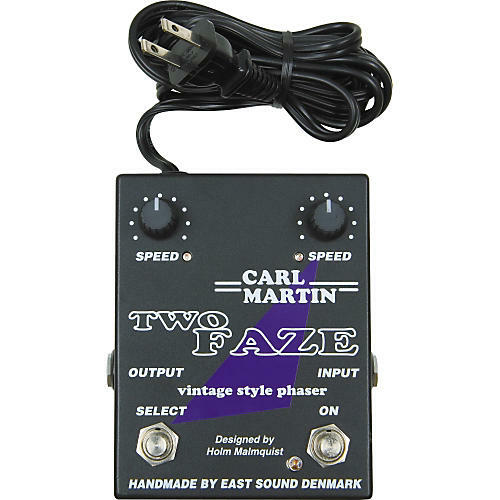 Designed by Holm Malmquist to combine vintage-style phase shifting with modern technological advantages, resulting in expanded headroom and improved sound quality. 2 identical and independent sets of speed controls with LED indicators that light up when in use and flash as speed indicators. 1/4" mono I/O, genuine bypass, and the ability to select between settings via a foot button on the box. Great for guitar, keyboards, or bass. Rich, super-quiet sound doesn't mask the signal input and is clean enough to rely on in the studio. Built-in regulated 12V power supply.